Shroompers and their tiny playhouse are too cute for words. Each darling doll is Waldorf inspired and made by hand with all eco-friendly, naturally antibacterial wool felt and other natural materials. Every doll is a unique creation, and there is an extensive collection of characters, so you're sure to find the perfect playtime companions for all the little ones you know. The dolls feature minimal, colorful designs and neutral facial expressions to encourage your child to get creative and use her imagination while playing. Of course all dolls need a home base, and the Shroompers woodland home fills this need perfectly. This is a home built to invigorate your child’s imagination. The stylish and creative Waldorf dollhouse is entirely handmade with natural antibacterial wool felt. The abode is stuffed firmly — so it’s flexible but keeps its shape. It also comes complete with a little yard (play mat). The Shroompers and their dwelling are hand-stitched with cotton thread, 100% wool felt and 100% wool filling. Details are glued on with non-toxic glue. Either the dolls alone, or the complete set of dolls and their playhouse make the perfect naturally creative holiday or birthday gift for any child. 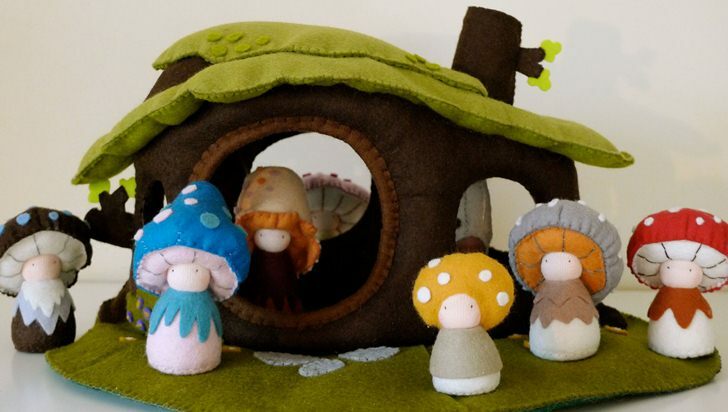 Of course all dolls need a home base, and the Shroompers woodland home fills this need perfectly. This is a home built to invigorate your child's imagination. The stylish and creative Waldorf dollhouse is entirely handmade with natural antibacterial wool felt. The abode is stuffed firmly -- so it's flexible but keeps its shape. It also comes complete with a little yard (play mat). 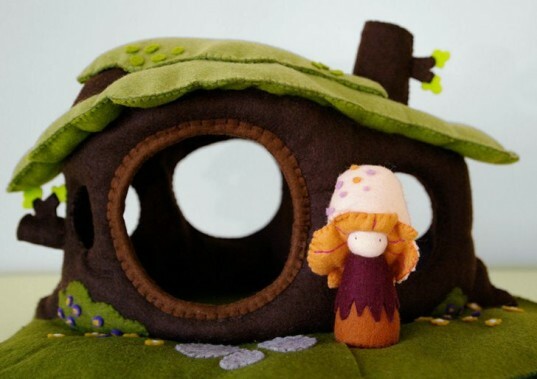 The Shroompers and their dwelling are hand-stitched with cotton thread, 100% wool felt and 100% wool filling. Details are glued on with non-toxic glue. Either the dolls alone, or the complete set of dolls and their playhouse make the perfect naturally creative holiday or birthday gift for any child. Each little creature has so much personality, that bringing them to life during imaginative play will be loads of fun for little ones.